If you're in the market for a new laptop, then the Dell XPS 15 and the 15-inch MacBook Pro (refreshed this year) have to be somewhere near the top of your list – but when it comes to the crunch, which of these computers is the best option for splashing some serious cash? These are two very different beasts of course, one running Windows and the other macOS. Here we'll compare the two laptops in all the important categories, including specs and software, so you're making a more informed choice if you decide to make a purchase. Here we're talking about the standard Dell XPS 15 laptop, not the more flexible 2-in-1 version, and it's clearly one of the best-looking Windows laptops you can set your eyes on at the moment. The carbon fibre keyboard deck and the brushed aluminium lid ooze quality and style, and then there's the lack of bezels around the 15.6-inch, 3,840 x 2,160 (or 1,920 x 1,080) pixel resolution display. It's a real stunner. Apple's 15-inch MacBook Pro is definitely a looker too: the aluminium unibody design has become a laptop classic, while the redesigned keyboard and Touch Bar look fantastic (even if the Touch Bar still doesn't actually do much). The MacBook Pro display measures 15.4 inches diagonally and runs at a native resolution of 2,880 x 1,800 pixels, so a little less or a little more than the Dell, depending on which configuration you go for. It can't offer bezels quite as narrow, however. It's hard to pick a winner in the design stakes – Apple and Dell have created two laptops here that are almost perfect in their aesthetics. There is only one black-and-grey colour option with the Dell though, while the MacBook Pro comes in silver or space grey. As is usual for Apple and Dell machines, these two laptops come in plenty of configurations, so you can pick one to suit your needs and budget. That means it's hard to compare specs directly. For the Dell XPS 15, options start with a 8th-generation Intel Core i5 CPU powering everything, with 8GB of RAM the lowest possible choice. At the top end, you can go all the way up to an 8th-gen Intel Core i9 CPU and 32GB of RAM (your exact options might vary depending on your part of the world). An Nvidia GeForce GTX 1050 Ti is the top-end graphics selection here, while storage options go right up to 2TB of SSD storage. You can get a seriously powerful machine if you've got the money for it. Apple's 15-inch MacBook Pro starts with an 8th-gen Intel Core i7 CPU and maxes out with an 8th-gen Intel Core i9 CPU. As far as memory goes, RAM starts at 16GB and goes up to 32GB depending how much you want to spend (and how powerful you want your computer to be). A Radeon Pro 560X is the highest possible graphics configuration on the MacBook Pro, while storage options go all the way up to an incredible 4TB SSD. Like the Dell, the available performance starts off high and just goes up from there, though if money is tight the Dell configuration prices start significantly lower. 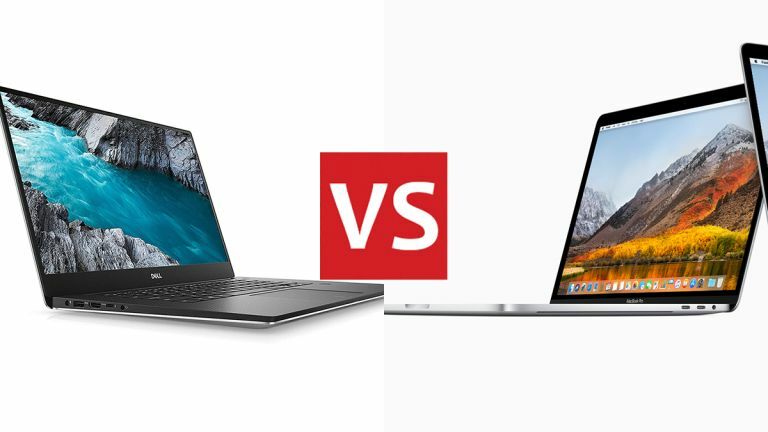 Besides all that raw performance, there are a few other features to know about when it comes to comparing these two laptops against each other. Both come with a few laptop staples – like a forward-facing webcam. The MacBook Pro has that distinctive Touch Bar, which may or may not come in handy depending on the applications you spend a lot of time in. The likes of Adobe and Apple itself support Touch Bar icons, but it hasn't been all that widely adopted yet. The Dell has a wider variety of ports: one USB 3.1, one HDMI 2.0, one Thunderbolt 3/USB-C and a headphone jack. The MacBook Pro has four Thunderbolt 3/USB-C ports and a headphone jack. Neither of these laptops can fold into the 2-in-1 configuration that's popular nowadays. Unlike Apple's laptop, the Dell XPS 15 can be fitted with a touchscreen, but you need to specify this when you're ordering it. Then there's the big one: Windows 10 vs macOS Mojave. Both are top-class operating systems, though obviously macOS is better for Apple apps and Windows is better for some serious gaming. It depends what programs you're going to be running and which OS you're already comfortable with. As we said at the start, these laptops show off the best that Windows and macOS have to offer, and at the end of the day the best one for you might depend on which of these desktop operating systems you're most fond of. Remember that your choice locks you into a certain ecosystem too. Apple MacBooks play very nicely with iPhones, for example, while if you're a fan of Android devices you might be better off going for the Windows option. Either machine will get you some premium performance and a spacious 15-inch screen – few laptops on the market today can be tricked out as much as the Dell XPS 15 and the new 15-inch MacBook Pro can, though of course you're going to have to pay for it (the MacBook Pro can cost you more than £6,000/$6,000). It's definitely worth comparing prices between the two, as there are so many different variables to pick from in terms of specs. Dell in particular is known for adjusting its prices as the cost of components go up and down. Ultimately these two laptops are hard to beat in terms of style and power – the only difficulty is in choosing between them. The winner there depends on your own tastes for hardware and software, rather than any major difference in features or specs.